Thai troops opened fire Friday in a tense standoff with protesters in the capital, where the army vowed to clear an area after clashes left one dead and a renegade general fighting for his life. A succession of gunshots that sent residents fleeing in panic were heard close to the Suan Lum Night Bazaar, popular with tourists. Protesters set fire to an empty police bus and vandalised army vehicles and water cannon. A foreign journalist with the France 24 television channel was shot in the leg during clashes between troops and protesters, the network said. 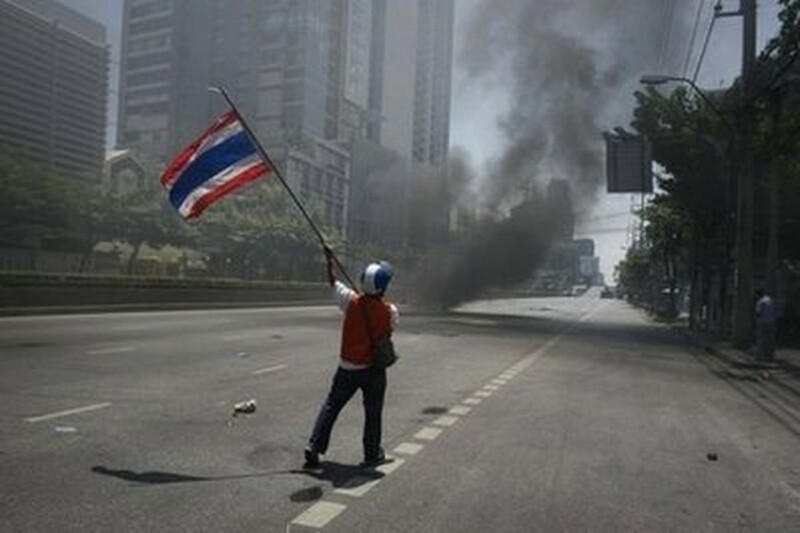 A 'Red Shirt anti-governement protester waves a national flag during clashes with Thai soldiers (not seen) in Bangkok. Troops were seen firing into nearby Lumpini Park, close to the anti-government Red Shirts' sprawling encampment, which has been fortified with razor wire, truck tyres doused with kerosene and sharpened bamboo poles. It was not clear if the troops were firing live ammunition, but the army has warned in the past it would use lethal force against "terrorist elements". A line of about 100 soldiers carrying assault rifles was seen near the park, according to an AFP reporter. Three Red Shirts were seen being detained by the security forces. Army spokesman Sunsern Kaewkumnerd said there were about 2,000 Red Shirt protesters in that area and they had "intimidated authorities with weapons" so an order was given Friday morning to disperse them. Around the wider protest area, which extends for several square kilometres (miles), soldiers blocked roads and set up checkpoints to seal off the area. "The total seal-off measure took place since yesterday evening," said Sunsern, adding that the electricity company had cut off the power to part of the capital. "Today we will meet to assess the measure," he said. As part of the operation, some of Bangkok's commuter rail system was shut, including a section through the key tourist area of Sukhumvit Road. The army had warned Thursday it would deploy snipers around the Reds' protest site and use armoured vehicles to prevent more demonstrators joining thousands who have essentially turned a large area of central Bangkok into occupied territory for two months, crippling an upscale retail district. The army's decision followed the shooting late Thursday of renegade Major-General Khattiya Sawasdipol, a high-profile Reds supporter, who had been accused of trying to stymie government moves to reconcile with the protesters. He was unconscious in the intensive care unit of Vahira hospital with a "quite low" chance of survival from a head wound, said Chaiwan Charoenchokethavee, the hospital director. Another demonstrator died after being shot in the head in clashes with security forces Thursday night. Eleven others were wounded, the Medical Service said. Core Red leaders had publicly distanced themselves from Khattiya, known by his followers as Seh Daeng, but after his shooting one top protester vowed there would be no surrender. "If you think the shooting of Seh Daeng will scare leaders and make them not dare to take the stage, you are wrong," one of the protest leaders, Jatuporn Prompan, said at the rally site. "We will not leave here as losers." The army denied involvement in the shooting as protesters dug in. Black-clad guards at entrances to the sprawling protest site in central Bangkok were armed with slingshots and arrows. They sealed access at one main entrance and reinforced another position with sandbags. Some Humvees were on the street but no armoured vehicles were seen as troops set up checkpoints. The fresh violence came after Prime Minister Abhisit Vejjajiva shelved a plan to hold early elections in November and hopes faded for a resolution to the crippling political crisis. The mostly poor and working class Reds, who launched their campaign in mid-March for immediate elections, initially agreed to enter the peace process but efforts to reach a deal that would see them go home eventually broke down. 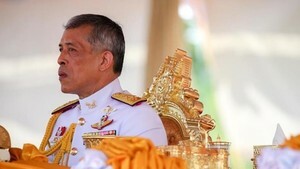 Bracing for further possible unrest, the government on Thursday extended a state of emergency to 15 more provinces. Almost one-third of the country including Bangkok is now under emergency rule. At least 30 people have been killed and about 1,000 injured in Bangkok in a series of confrontations and attacks since the protests began -- Thailand's worst political violence in almost two decades.